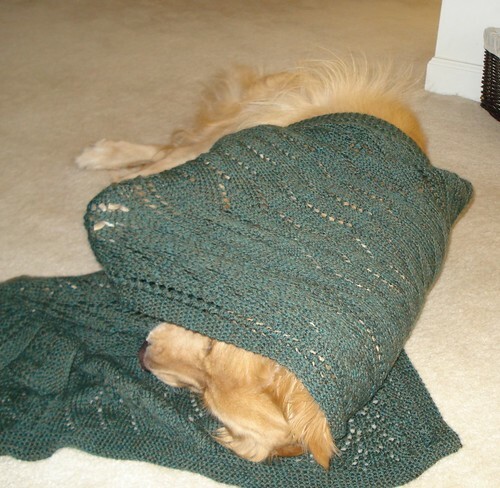 Finn is demonstrating the correct way to wear a shawl. Now he is showing why it is sometimes called a wrap. Fiber shows up once a month - this is always a good thing (and the price seems very reasonable to me). I don't know what fiber or what color I'll be getting until I get it. Surprises can be fun, and even if it's something that I wouldn't normally purchase colorwise, it might challenge me to figure out a way to use it or just get me out of my normal color rut. Since I figured out how to combine several smaller lots of fiber into a single yarn (like I did with the pale blue greens that are waiting to be plied), small batches of handdyed fibers can become more than just socks, shawls, hats and small accessories. Now they can be bigger projects, which really opens up possibilities for using them. So the picture above is what I got yesterday for the November club fiber - Pie for Everyone! Love the name and it cracks me up that not only did she dye the roving to match all kinds of different pies (as well as chocolate cheesecake), it really works and I think it will spin up to be an interesting yarn. 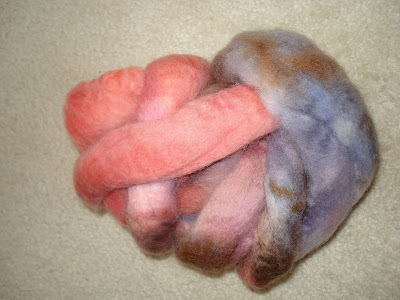 The fiber is Falkland which is a medium grade wool on the soft side. It has lots of bounce as well and can be used successfully for a wide range of project types, so while I have no definite plans for what I'll do with it, I can do lots of different things if I want to. I'm almost finished with Solace! At this point I have less than 2 repeats to go, plus my garter stitch edging. I will block it some when I get it finished, but it won't be a hard blocking. I'll wash it and then smooth it out flat to dry - no pins, no stretching. Ramius has been sitting underneath it while I knit and he is happy to report that it does work properly and keeps him quite warm. That's a huge relief - I'd hate to get this all knitted and it didn't keep the cat warm! Yesterday I did something that some would probably consider crazy, but it worked. I felted my ribbed raglan sweater in the washing machine. The day I got the pictures for the blog, I had just put the sweater on. By that evening, after wearing it all day, it was longer and droopy. I had been afraid that that might happen but I wasn't sure (this is where one of those swatchy things you hear so much about would have helped out). The yarn was a bulky weight and I don't care what size sweater you knit with bulky weight yarn, it's going to have some heft to it. Now if it had been a firmer yarn that probably wouldn't have been a problem, but this particular yarn (Elann Peruvian Chunky) is a two ply with lots of loft - probably to help offset the weight of the finished project. When I washed the sweater after I had finished it, I noticed that it seemed very floppy and the yarn seemed to REALLY relax when it was wet. Once it dried it felt right again, but as I said, after a full day of wearing it, it relaxed and drooped. Now I've done a few felted bags and a cat bed that Ramius pretty much refuses to use and I know that when you throw a knitted something in the washing machine to felt (or full - I'm not going to get into a discussion of the differences here), it shrinks more lengthwise than width wise. Since that was the direction I was wanting to shrink it seemed like a logical choice. If you've never felted anything before, it takes two of three things to do: hot water, agitation, and alkalinity. If you want to felt something really fast, you use all three. I wanted the sweater to just barely start to felt, to firm it up and make the fabric more stable so it wouldn't droop, but I didn't want to shrink it down to Caleb's size, so I chose to use warm water, agitation from the washing machine and alkalinity (soap is alkaline). Checking the sweater every couple of minutes, I stood over the washing machine to make sure that it was not shrinking too fast and after about 8 minutes, I could feel that the fabric was starting to firm up some. I gave it another minute or two and spun the soapy water out, rinsed it and now it's laying flat to dry. It's not any narrower than it was, but it's a little shorter and it's a little firmer, which should also have the benefit of being warmer. I think it's perfect now. 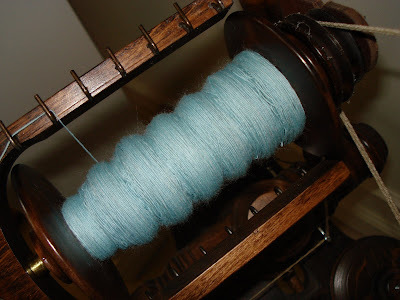 Over the long weekend I got a LOT of spinning done. See the bobbins in the picture above? Those are the BFL in the Love in a Mist colorway from The Fiber Denn (Ebay and Etsy). Know what that means? Not only do I have these three done, but before I spun them, I finished the last bobbin and a half of Ice Blue Merino Top singles. So now I have finished spinning all the singles for this project! Yippeeee! I have 9 bobbins waiting to be plied into 3 plied yarn, but the newest singles need to age a bit so the twist isn't as active in order to work better with the older singles. 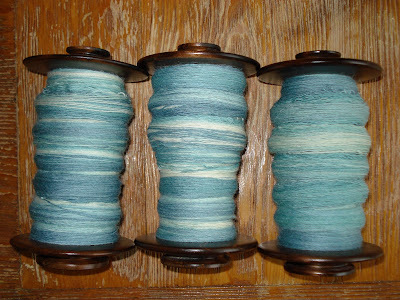 In my typical (and I believe charming) obsessive compulsive style, I have organized the bobbins to be plied together. The first bobbin that I spun of the Love in a Mist will be plied with the second bobbin I spun of the Ice Blue Merino and the third bobbin I spun of Mojito Love. (I was just as obsessive about the other bobbins' combinations, I just can't remember them off the top of my head - I have it written down upstairs.) My theory is that since I mentally approached each new fiber as a new spinning project (although all were spun worsted to the same wraps per inch and at the same ratio), if my spinning changed any from bobbin to bobbin, by shuffling them around like this, the finished yarns will all balance out in the end. I think the finished yarn will probably be around sport to DK weight (6-5.5 stitches per inch) when it's knitted up. I also think that by using 3 different fibers in the same general color family might have helped to keep me from getting bored during the spinning. It also was a great way to use the smaller lots of fibers that I think all spinners seem to collect - I mean really, there's kind of a limit to how many socks, hats and scarves you really need (well, maybe not socks) and not all fibers will work for everything. I might try this little fiber/color mixing thing again if I like how this one works out. Once I got the rolling issue figured out, this new cardi is moving along nicely. At this point I've finished with the buttonholes (and marked the placement for the buttons later), I've started the front neck shaping, and I'm 4 cm from dividing the fronts and back at the armholes. I need to go back and weave in some ends where I joined new balls of yarn, because I can tell that when I get this done I'm going to want to wear it - not mess around with finishing a bunch of ends. Thanks for all the wonderful comments on the sweater yesterday (and Finn's dancing skills). A couple of you asked if I would be writing up the pattern and since it's really just an adaption of the raglan design from Ann Budd's Knitter's Handy Guide to Sweater Patterns, I won't be making a pattern of it. If you wanted to try making one for yourself, I'd recommend using my blog notes and that book and just going for it. It's not a difficult design! It finally dried late Friday and today I'm wearing it! Let me tell you, it is one snuggly, warm sweater. What do you think? 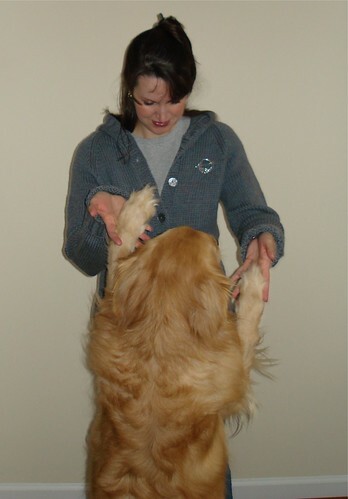 It also likes to dance with Finn! Well, the bad news is that with all the rain yesterday and possibly with some help from Finn, the ribbed raglan isn't dry yet so I don't have pics of it being worn. I will get those over the weekend and on Monday I'll blog them. 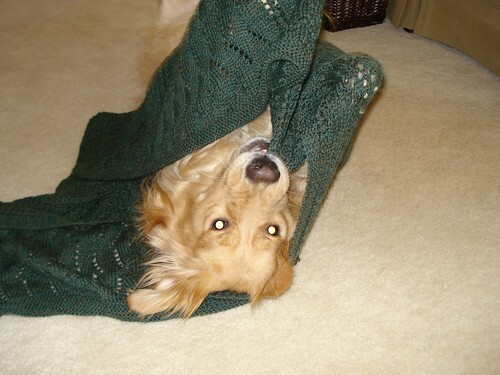 How is Finn helping with the drying of the sweater? Well, this is the first sweater that I've ever tried to dry in a Finn Accessible Location in our house. 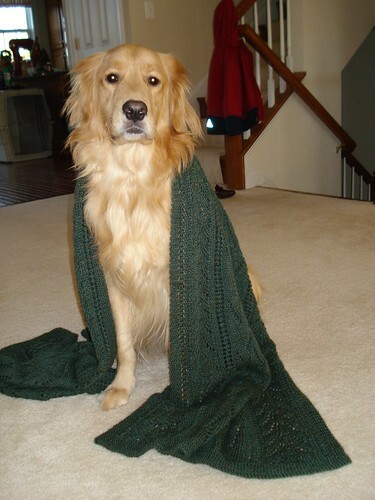 He's really good with my knitting and despite the occasional attempted stealth roll in raw fleece and the rubbing against all new wool and yarns that enter the house, I thought he could probably handle a drying sweater. So I spread the sweater out on a towel in our bedroom under the ceiling fan, hoping to help it dry. Then I put away the extra yarn and the book and my notes from the knitting and checked on the sweater one more time to make sure I had it arranged right - except that I couldn't find the sweater. In the place where the sweater had been, there was Finn - laying on his back, all four feet in the air with an expression of pure doggy bliss on his face. Periodically he'd give a little full body wiggle and sigh contentedly. Once I moved Finn, I found the sweater, kind of blond and fuzzy and definitely not the way I had left it. After re fixing the sweater, pulling off as much fuzz as I could, and telling Finn that he wasn't supposed to be laying on it, I took Finn downstairs and kept an eye on him. Clearly Finn isn't ready to be allowed to help sweaters to dry yet. Yes, I am past the hem of the red cardi. (I know, it's photographing as more of a red orange but it's really not - red is just one of the hardest colors to photograph correctly for some reason.) I knit the hem 3 cm long (the pattern is from a German yarn company I think, it seemed right to measure in metric for this one) and I think it's going to work nicely. There was a comment yesterday about using seed stitch on the lower edge instead of ribbing or possibly garter stitch. Both of those would help to stop the rolling, but neither would have been heavier than ribbing which is why I chose to use a hem - double thickness = more weight to hold down the crazy curly edge. 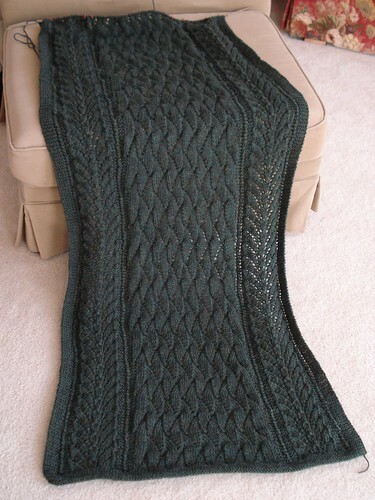 By the way, if you're in Ravelry, this pattern is listed in there and you can see how other people have done it. There is a gorgeous brown version that used KnitPicks Andean Treasure. It's a 100% alpaca yarn like the yarn the sweater was originally designed for and there is no apparent rolling of the lower edge going on. I just thought I'd mention that in case some of you really like the design but don't want to fool around with a hem or crazy curling lower edges. If I like this sweater half as much as I think I will, I might go back and do it again as it was written in this yarn - I love the Lilac Heather and Wild Rose Heather colors. Decisions, decisions. Thanks for all the kind words yesterday about the sweater. It's trying to dry now but it's raining so it might take all day. Since I've never used this yarn and I realize that doing two projects in a row without a gauge swatch is just asking for trouble (no, I didn't work a swatch on the first version of the sweater with yesterday's yarn, why do you ask? 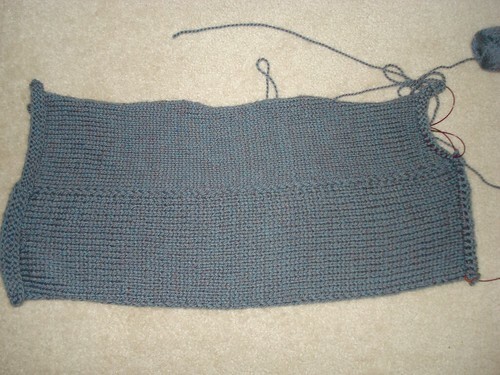 ), I cast on for a gauge swatch. It came out perfectly on gauge but it did something interesting. It curls. Now all stockinette tends to roll to the right side because the fronts of knitting stitches are slightly smaller than the backs (I don't know why, I just know that's the way it is), so I knit a swatch and then washed it and smooshed it flat. I was pretty sure that it would be fine. So I cast on for the sweater back. I knit. It rolled. I kept knitting. It kept rolling. I knit 5 inches of back on that thing and it kept curling up in a roll right next to the needles. All 5 inches of it. I checked my swatch again. Still wet, but still drying pretty flat. Then I picked up my swatch and messed with it a bit - uh oh, it was starting to roll a bit. Now granted, this was not a properly blocked swatch with pins keeping it still while it dried, but I don't want the bottom of this sweater to roll up to the underarms every time I wear it. I was starting to be afraid that if I wore this sweater while it was dry (which is the usual way I wear things) and moved at all while wearing it (which is nice to be able to do), I would end up with rolled edges. So, I did some thinking about my options. I do love the design and since it's written for a 100% alpaca yarn and I'm using an alpaca and Tencel yarn (neither yarn would have any natural memory or stretch recovery), I think the yarn will work for the design. I also love the yarn - it's got a nice feel to it, just a bit of alpaca bloom and the tencel should make it a bit less dense than a 100% alpaca yarn would be, and let's face it, finding a really great red is hard to do and this red is seriously pretty. So, the bottom line is that I will be knitting this design in this yarn, but I have to solve the rolling problem first. I'm going to have to pull out the big guns for this little cardi - a hem! A hem, if it's wide enough, should fix the rolling problem and add enough weight to keep the bottom of the sweater where I want it. I've got to sit down with the pattern and do some re figuring because I'd rather attach the hem to the body of the sweater by knitting the hem in (start with a provisional cast on, knit the hem, do a turning row, start the body of the sweater, when the body is the same length as the hem, undo the provisional cast on and knit the two rows together - voila, hem attached to sweater no going back and fixing things), and knitting side seams with already attached hems is going to be bulky and messy, so it looks like I'll be knitting the body in one piece to the underarms. I'll also have to take a look at the sleeves and decide if I want to do the slight bell shaping they call for in the pattern or just knit the cuffs straight. Almost there! I'll be finishing this sweater today and I'm so excited about it! All I have left to do is sew in some yarn ends, add buttons and block the whole thing (I'll probably wash it just because it's been two different sweaters already). I'll get a picture of it on after it's dry and post in on Friday. That will make this sweater 6 days from start to finish! I haven't lost my momentum on this! (And yes, I am eating and sleeping and doing laundry and all the other things around here that I do.) The secret is the huge gauge (4 stitches per inch and about 5 rows per inch). I've finished the sleeves (haven't sewn them up yet which is why they look strange and gorilla like) and have joined them to the body and now I'm working on the raglan decreases. I will work the shaping directions for a crew neck (modified of course, because I almost never follow directions), working them as short rows to keep the stitches live, then I'll work the hood. Want to know how I'll do the hood? I'm making it up as I go along. That's right - we'll be off-roading! I've looked at a couple of other patterns with hoods to see how they're done, including Bonne Marie's Twist (love this design, it's on my to do list). Of course the gauge is different so I figure I'll just design it as I go. After all, my head is right here with me and so is my neck and that's the part that hoods are for so how hard can it be? 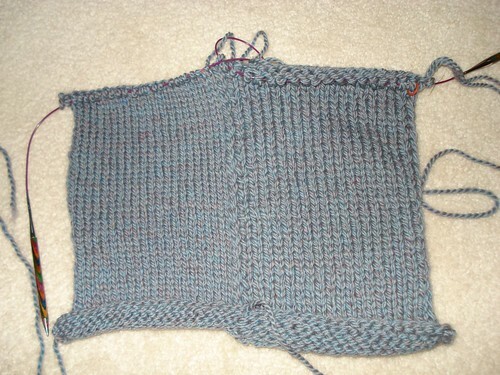 On Friday, after I blogged, I began frogging the wrap cardi. By lunchtime I was ready to start fresh. So what am I doing? 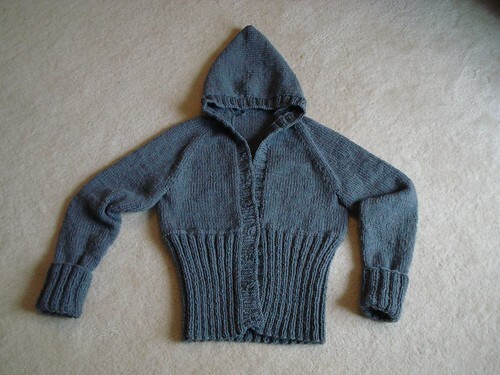 I had in mind a hooded, button front cardi with a ribbed empire waist and deep ribbed turn back cuffs so I pulled out Ann Budd's Knitter's Handy Guide to Sweaters, decided on a raglan shape, found my gauge and desired size and started making changes. In such a chunky yarn, I knew I needed my front bands to be fairly wide (dainty front bands in this gauge would look really dumb and try to flip around like crazy), so I took some stitches from the fronts to accommodate these. If I hadn't done this, the sweater would be bigger than I had planned and for this idea to work it needs to fit pretty close to my body. The second change I made was regarding size. My hip area is bigger than my front porch so I cast on for the 38 inch size, knowing that the ribbing should fit perfectly over the hip area and compress in around my waist so I won't look like the Goodyear blimp. At approximately where the cardi was long enough to hit under my bustline, I worked some decreases down to the 36 inch size in the last row of ribbing, worked a Vikkel braid (see Nancy Bush's Folk Knitting in Estonia for more information on that) and switched to stockinette. As you can see below, I now have the body on a holder and it's waiting for the sleeves. When I went to grab some double points to begin my sleeves, I found that I didn't have any in the right size. I don't do Magic Loop or any of the other acrobatic circular tricks that have been recently figured out, so instead of losing momentum, I decided to knit my sleeves flat, which also gave me the chance to knit them both at the same time. 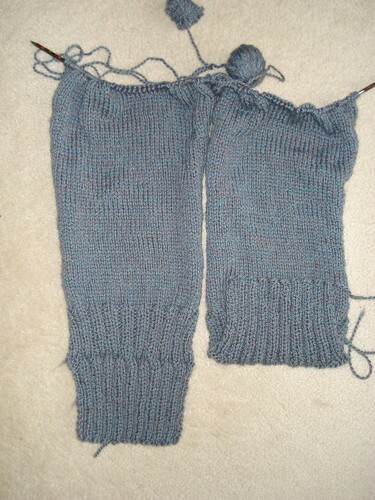 As you can see, I've got about 3 more inches until I'm ready to bind off for the underarm and join these to the body. 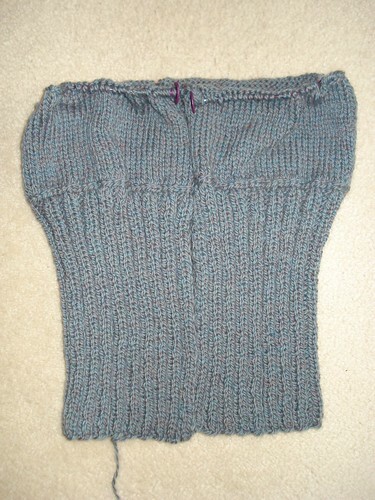 I did a little trick with the ribbed cuffs - if you look, you'll see a little jog in the ribbing. There is a reason for this. By starting the ribbing as K2, P2, when I got to the place I wanted them to turn back, I worked a purl row on the RS (makes it turn better) and then switched the ribbing to P2, K2. This way, when I turn it back, the ribs will "lock" into each other and won't try to unfold. It also lays a bit flatter when the ribs mesh like this. The top part of the ribbing, where the cuff will fold over isn't as long as the cuff itself because I didn't want ribbing peeking out at the top of the turn backs. 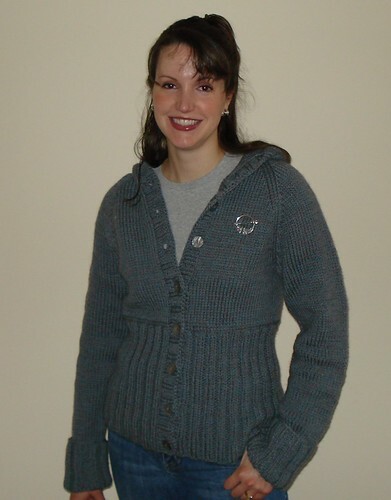 Clearly, frogging the wrap cardi was the right thing to do since this sweater is practically flying off the needles! Do you know what this is? It's the right front of the wrap cardi. It's at the point now that I'm ready to do a three needle bind off at the shoulder area with the back and then finish knitting the front band section and kitchener stitch it to the other front band section, but you know what? I'm not going to. I'm going to frog it. Yep, that's right. I'm just not feeling the love with this project and it might have to do with the fiddlyness of the fronts or it might have to do with the fact that last night I figured out a much easier way to get basically the same design. Wanna hear my idea? (Disclaimer - this only works in my head. I haven't tried it in real life with yarn so if you give it a try you do so at your own risk.) OK, the pattern has you knit the front bands along with the fronts, which ordinarily would be a time saver right? Not in this case, because the single strand/double strand of the yarn and the small needle/big needle thing that's going on really slow you down. It would have been faster to just knit the fronts, then go back and add front bands. So, I figured out, I should have just knit the front sections, attached them to the back and then gone back and picked up for the collar band all the way around. I've already eliminated the Kitchenering part of the collar and if I work the collar band in doubled yarn with the bigger needles and pick up three stitches for every 4 along the fronts and one for one along the back neck, with the change in gauge, it should naturally add enough fullness for the collar to roll properly without any other shaping on my part. Did you get that? Do you see how simple this design could have been rather than being written as a feat of needle skill and yarn untangling that it is? I have no clue what I'll knit with the yarn. I might knit up what I just described, just to prove that it can be done, or I might find something else to do with it, but as soon as I finish up on the computer this morning, I'm going to frog this silly thing. Anyone know a good pattern with a gauge of 4 stitches per inch? OK, I know you've got to be getting tired of this but do you see what it is? It's a new bobbin of the Ice Blue Merino Top! 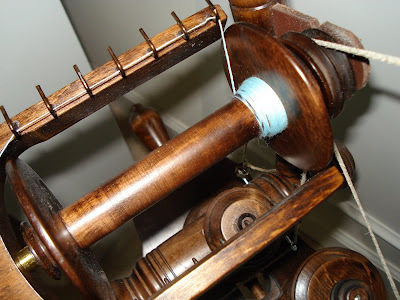 Yes, this is the start of the second bobbin. Why you should care (or at least be nice and pretend to care) is that somewhere in the middle of this bobbin I will pass the midpoint of this spinning project. Unless I'm seriously having math problems this morning, 3 fibers spun into singles on 3 bobbins each equals 9 bobbins, so the midpoint is 4 1/2 bobbins, right? I think I've also figured out a way to make the spinning go faster on this top. Since it's solid colored, it's not really that exciting to spin and since I was spinning from a long snake of it, it was hard to see how much I had gotten done. So, I decided to pull the long snake into 4 smaller snakes and now I'll know where I am on the bobbin. This should help to keep me motivated and knowing that the last three bobbins will be of handdyed fiber with color variations will also inspire me. By the way, I promise you will not have to look at a bobbin of singles from this project more than once a week from here on out. Now if I start another project on my other wheel, I might show it to you every 20 minutes, but this project, once a week. Tops. Majestic Mountains Corrections and a Surprise! 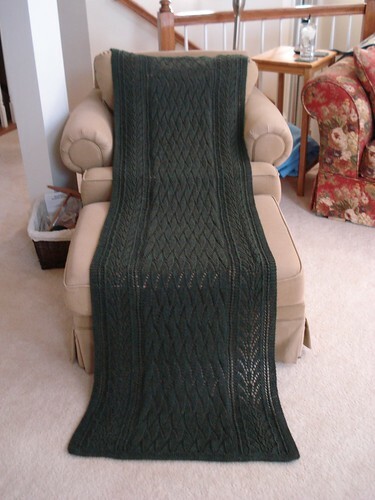 Go to Ravelry and look at the Majestic Mountains pattern listing if you are a member. Check in the files section of the KAL for Majestic Mountains if you are a member of that. Email my Mom at GeorginaBowCreations AT Yahoo DOT com and ask her to send you the errata pdf file. Please be patient, she will be sending these out individually, so it could take a couple of days to get it. If you don't get it within 5 days, drop her another email - your's might have gotten lost. If you purchase the pattern anytime after November 6, you will get the errata pdf delivered to you with the pattern file. Thank you. Guess what? There is a new Pink Lemon Twist Pattern, but it won't be released to the public until the end of January. Want to know how to get it earlier? This past Spring I was contacted by Valerie of Yarn4Socks about a pattern for their sock club. We decided I would design the pattern for the December Sock. On Monday I sent her the Exclusive Yarn 4 Socks Sock Club Edition of this pattern. It has two sock designs in it - Scarborough Fair and Caledonian Mist. The Scarborough Fair design is the December pattern. Now, you're wondering what all of this is about if you're not a member of the club aren't you? Well, they have a few openings for the December part of this club left so if you hurry, you can sign up and get the brand new PinkLemonTwist sock designs before they go public as well as some really gorgeous sock yarn (I got to knit the sock in the actual club yarn - yummy!) to work it up in. Interested? Just go here for more details and to sign up. I'm not going to post a picture (it's a surprise), but personally I think this might be the best sock design I've come up with so far! So click the link above and sign up if you're interested. 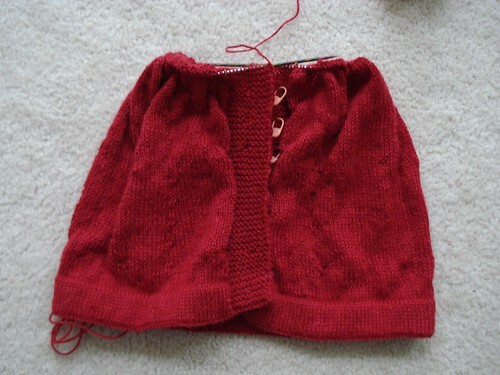 I'm now more than halfway to the armhole shaping for the right front of the Wrap Cardi from Vogue Holiday 2006. I would love to make it past the armholes today, but I don't know if I'll have that much knitting time. A commenter last time I showed this sweater asked if it was a difficult sweater. She was apparently a newer knitter and was thinking about knitting it, but what with all my moaning and groaning was questioning whether or not this was an easy project. The answer is that no, it's not a difficult sweater design. It's pretty much stockinette stitch and the back and sleeves (even though I haven't knit the sleeves yet) are straightforward and easy. The part that has me moaning and groaning are the fronts. If you look at the picture above, you can see that the first half of the right front is worked on large needles with two strands of yarn. 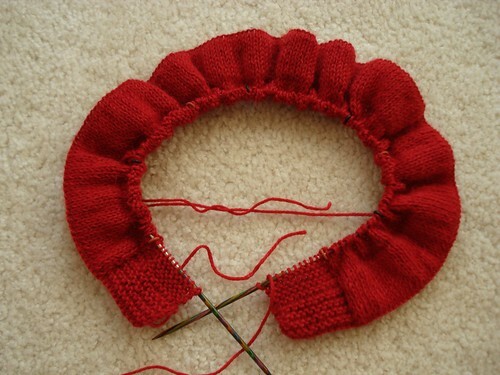 Then, halfway across, you drop one strand and switch to smaller needles. Theoretically, this isn't a big deal, but with the needle changing you have to be sure to keep your tension where you change or you'll have a big, honking, ladder gap there. Also, "drop one strand" sounds easy, but for some reason that eludes me (alright, I just don't care quite enough to figure it out) after working the doubled yarn section, the strands of yarn are nicely wrapped around each other. So I have to unwind the balls of yarn every time I "drop one strand." Not quite so much of the dropping going on. Finally, I have a notoriously short attention span and I like to knit both fronts of cardis and both sleeves at the same time on the same needle. That way my tension is the same for both, the shaping is identical, I don't have to keep meticulous notes, and when I'm done, I'm done. 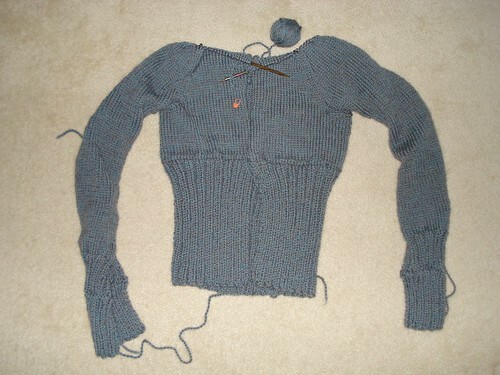 I can do the sleeves this way, but the fronts would probably have killed me - two different sizes of needles and 4 balls of yarn and the yarn getting twisted around itself like it had been played with by a kitten on speed just makes me queasy to think about. So basically what I'm saying is no, this is not a hard pattern to do. It is fiddly for the fronts, but if you love the design and have the intestinal fortitude to plow through the fiddliness, it's very doable. Does this help? No, I wasn't abducted by aliens or taken by the boogie man on Halloween. Yesterday was nuts and from 6:45 AM until about 6:30 PM, I was running around doing things. By 6:45 I had my PJ's on and was sitting on the sofa like a lump. So, what with Halloween and then yesterday, I don't have a lot to show you, but I have almost finished the first bobbin on the Ice Blue Merino Top for my spinning project. Yes, that's right, I haven't finished the first bobbin, I've ALMOST finished it. Pretty sad, huh? Of course the fact that I haven't done very much spinning this week might have something to do with the lack of progress, but I'm not sure - aren't there spinning fairies who will come in and help? Anyway, I hope you all have a wonderful weekend and stay warm!